Member of the Freebase community since it began 5 years ago. This is what I've learned from building applications on top of a KG and helping other developers do the same. The web is changing from a web of documents to a web of things. Users expect applications to know about the real-world things that they care about. This creates opportunities to build new types of applications and enhance existing applications. Today I'm going to show you examples of applications built using a Knowledge Graph. 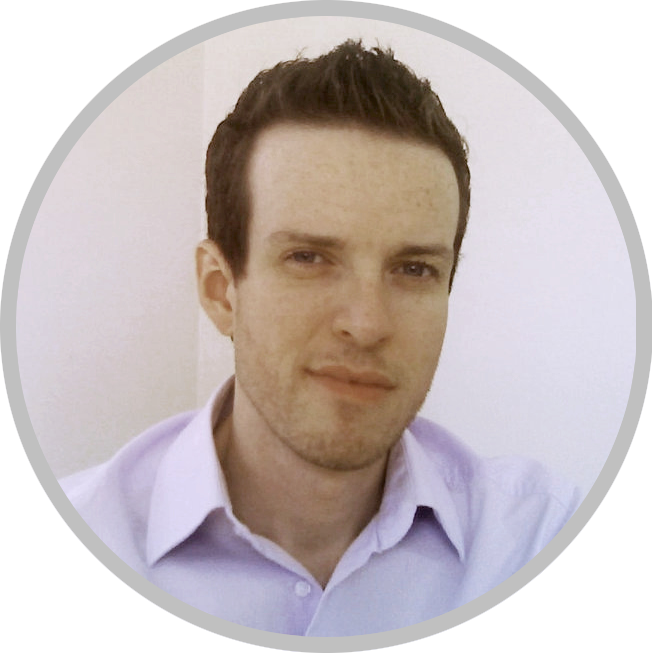 I'll show common design patterns that help you tap into the power of the Knowledge Graph. And we'll look at some sample code to help you get started. You saw on Wednesday how you can query the KG from your Android phone. A collection of real-world entities. Interesting facts about those entities. Meaningful relationships between the entities. 23M+ topics, 2k+ commons types. A source for Google’s Knowledge Graph. Anyone with a Google account can contribute. Like Wikipedia. Every type, property and topic has its own page which let you view and edit them. Imagine what new types of applications we can build on top of a KG. Applications that understand real-world entities. Applications that allow users to interact with entities in intuitive ways. Applications that scale to millions of things. Next we're going to look at some ways that you can build these sorts of applications right now. Discovery Patterns: a way to convert things to strings. Not just limited to strings. The user wants to specify an exact entity rather than just keywords. Keywords can be ambiguous so we need to be able to present them with options. Not just limited to keywords. Images, articles, geo-coordinates, etc. can all be reconciled to entities. Present the user with a list of disambiguated entities. Use reconciliation algorithms to automatically match entities. Combine both techniques to get the best results. Ranker.com is a site that lets you create and share ranked lists of things. Here we see their list editor which prompts you to enter a new entity. 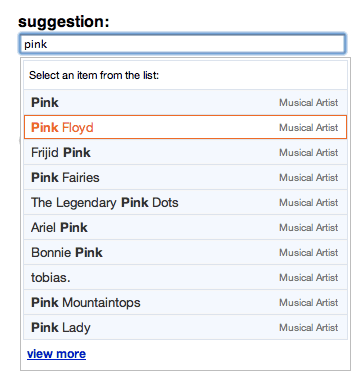 The autocomplete box looks up possible matching entities in their database. Lets the user create a new entity if needed. Easy to add to any web app. Takes keyword input and returns entity name and ID. When we need entity IDs for known entity names. When we need disambiguated topics. Amen is a social app that lets you state strong opinions about real world things. Uses Freebase Suggest API to suggest entities. Users can click on entities to see other opinions about that entity. User wants to learn more about the subject matter of an article, video, image or other piece of content. Parse structured markup like Schema.org, RDFa and Microformats. DBpedia Spotlight is an open source project. 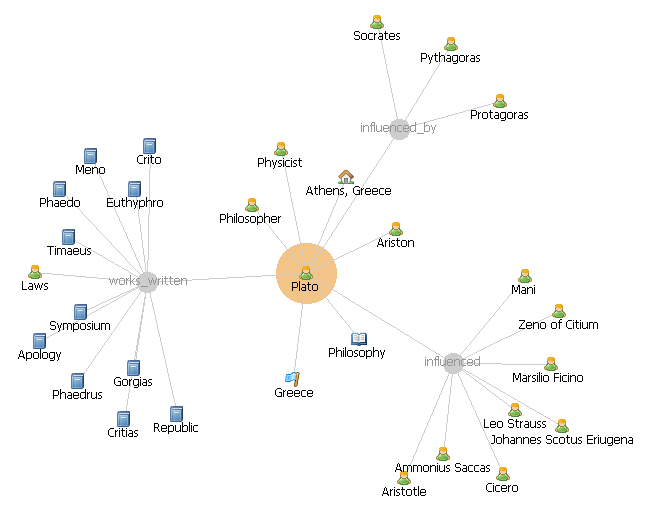 DBpedia is a project to extract structured data about entities from Wikipedia. 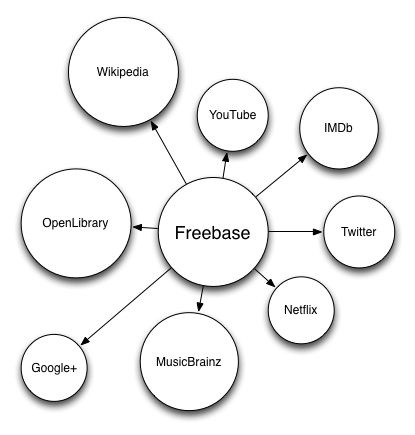 DBpedia IDs can be easily mapped to other sources like Freebase. Lots of existing content without entities identified. Need to identify relevant entities. 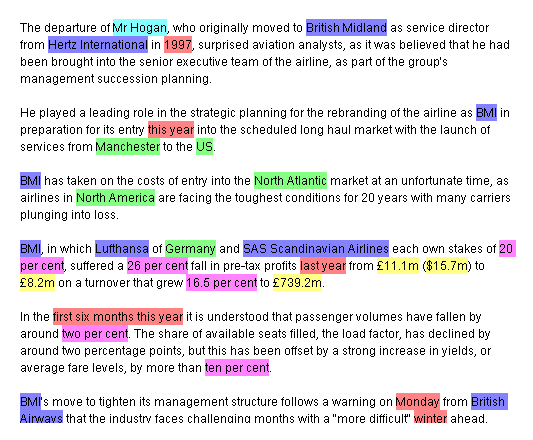 Too much content to manually mark it up with entities. Services like OpenCalais, AlchemyAPI and Zemanta also use Freebase data to look up named entities in text. They all return Freebase IDs. This is how users interact with your application. Entities allow us to navigate your data according to real world things. Also allows us to describe meaningful relationships between things. User wants to find and filter interesting data. 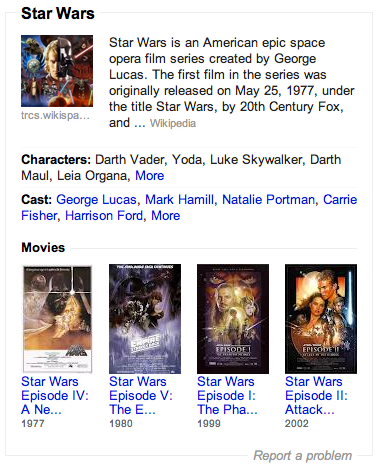 Knowledge Graph is large and not all the data is going to interesting to the user. No single way to organize data in order to surface interesting results. Count up how frequently each facet (property or value) occurs and allow the user to filter the data. Show different types of facets depending on what data is being shown. When a user searches for a recipe, Google provides faceted search. The choices for each facet vary depending on the results. Clicking a facet automatically does a new, constrained search. Results format matches query format. This query could be used to build a faceting interface. Simple REST API call using standard Google API Client Library. Use Google client library to run the same query from your app. Too many different facts about entities. Can’t simply provide a list of results. Uses faceting pattern to drill down into messy data and find patterns. We want to encourage deeper exploration of our content. Use semantic relationships between entities to make meaningful recommendations for related entities. Not only can we say that they're related by we can also say why. Entities must be reconciled for this to work. When there are too many possible ways to organize the content and each different users will have varied tastes. Ookaboo is a repository of freely licensed images organized by entity. Every entity has its own page with a description and pictures. The right-hand side has suggestions for other related entities. Ookaboo uses Freebase data to figure out which entities might be related. Makes it much easier to explore a large collection of images. The final part of your application. Not just a shiny distraction. Its all based on real data so it adds a lot of value. The key is to mix the KG content with your existing content. We want to describe an entity. User needs clues to know which entity we're talking about. how do they know which "John Smith" we're talking about? Display a short summary including name, image, description and relevant property values. When we have content that needs to be put in the context of one or more entities. When we want to encourage people to navigate content by entities, we can reinforce that by showing which entities are relevant to each piece of content. This article reviews several movies. Each one has a topic on the right. Reconcilation pattern makes this all possible. Also great example of Mashup Pattern. Wouldn't be possible without recon. User wants to see different types of information about the same entity. Different sites or data sources. Different types of data about the same entity. Hard to combine data from different sources. Create links between the same entity in different datasets/contexts. Encourage users to jump between different contexts for the same entity. 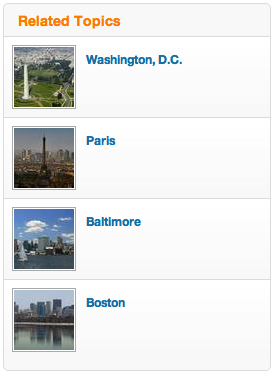 You can think of these links as "foreign keys" in your database. Seevl is a music recommendation service. It works as a Chrome extension that injects addition information into YouTube pages. When Seevl detects an artist that it knows about, it inserts a topic summary. Also recommends similar artists that you might like. Makes recommendations based on proximity in the knowledge graph and also weights some relationships more than others. Lets you get all the property values for an entity. Need to see information from different perspectives. Different information about different entities is not available from the same source or website. Sameas.org is a data dub that links together different datasets on the web. It has a simple JSON API that you can use. Every entity has a cluster of IDs which are all said to be the "same as" each other. 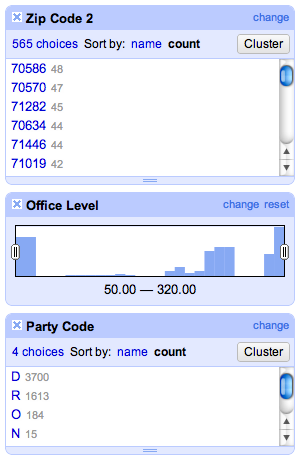 This lets you easily combine data from datasets. We want to display many different entities. Showing summaries for each entity is repetitive and doesn't fully show the relationships between the entities. Use data visualization techniques to display many different entities at once in a semantically meaningful way. When its important to be able to see the relationships between multiple entities at the same time. Uses both maps and timeline visualizations. Use discovery patterns to surface entities in your apps. Use interaction patterns to allow users to navigate in meaningful ways. Use presentation patterns to create informative user interfaces. Build entity-oriented applications that scale with the web. Here are a list of resources to help you get started. This is not just for new apps. Existing apps can also be enhanced with entities.